The Busch und Muller Toplight Flat Plus rear light uses a powerful LED for reliable performance. The light emitted by a reliable LED is projected around a wide 220 degree angle making the light, and you, extremely visible. This all comes from a single very and very bright device. The dynamo version of the light has a "standlicht" which means the LED is kept on when you stop moving. It takes just a few minutes riding before this feature is activated. The standlicht operates using a capacitor. There are no batteries to wear out. It's just 20 mm thick and weighs just 65 grams. 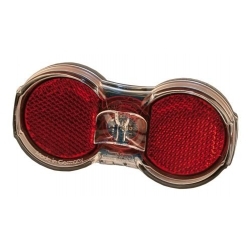 The battery version has an automatic switching feature so that it comes on when it is dark and there is movement and remains on until the bicycle is once again stationary. This light mounts permanently using two bolts onto the rear rack. The two fixing holes can be at either of the common 50 mm or 80 mm spacings. Can be mounted on your saddle rails with an adaptor. 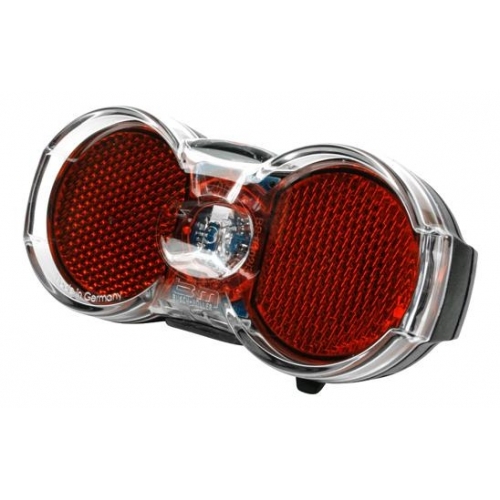 These rear light can be combined with any of our front lights to make a complete dynamo or battery based lighting system.